Motherwell manager Stephen Robinson was sent to the stand for his reaction to the controversial 32nd minute penalty award by referee Craig Thomson during Sunday's heavy 7-1 defeat at Ibrox, writes Craig Goldthorp. Thomson - vilified by 'Well fans for sending off Cedric Kipre and awarding Celtic a penalty in last season's Betfred Cup final defeat - was at it again during this league match as he sent off Carl McHugh for blocking Andy Halliday's shot with his arm and giving Rangers a penalty which James Tavernier scored to put them 2-1 up. 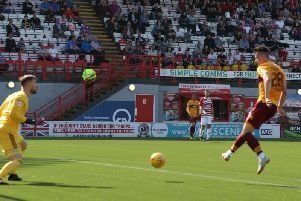 Motherwell had started reasonably well and came close to breaking the deadlock after just a minute of this Scottish Premiership encounter when Gael Bigirimana's low free-kick from 25 yards whistled just past the left post. But Scott Arfield found acres of space to collect a long cross from the right after seven minutes and sweep Rangers ahead. The Steelmen produced a fine passing move on 18 minutes which culminated in McHugh sending a left foot shot just off target. Rangers came close to doubling their lead on 21 minutes when Alfredo Morelos headed over after a cross from the right. Motherwell then stunned Ibrox with a 24th minute equaliser when Ryan Bowman did brilliantly on the left before squaring for Main to tap in from close range. But the Steelmen were sickened on 32 minutes when they conceded a penalty goal and had Carl McHugh sent off for handball. Andy shot struck McHugh's hand and the Irishman was dismissed by referee Thomson. Motherwell gaffer Robinson was sent to the stand for his reaction to the decision. Tavernier duly slotted home from the spot to put Gers 2-1 up, with a twice taken penalty. And Rangers went 3-1 up soon afterwards when Alfredo Morelos headed in a Glenn Middleton corner from the right. The Light Blues ran riot in the second half with Middleton stroking home a fourth goal on 58 minutes, Arfield making it 5-1 two minutes later and Grezda waltzing through to make it 6-1 on 67 minutes. Visiting keeper Trevor Carson made a brilliant save from an Ovie Ejaria shot at the expense of a corner. But a short flag kick to Tavernier saw his cross headed in by Grezda for 7-1. Motherwell's Liam Grimshaw produced a brave late run forward but skewed his shot well off target. Motherwell: Carson, Tait, McHugh, Aldred, Hartley, Cadden, Main, Bowman (Rose 45), Grimshaw, Bigirimana (Mbulu 79), Turnbull (Campbell 62).